To retain the steel intact with its full initial strength. To provide the surface a more pleasing appearance. To increase the life of any suitable organic finishing system applied over it. To protect the steel from corrosive attack in most atmospheres, acting as a continuous and lasting shield between steel and the atmosphere. The process of galvanizing steel sheet was developed simultaneously in France and England in 1837. Both of these methods employed a ‘hot dipping’ process to coat steel sheet with zinc. Galvanizing is carried out on cold rolled sheets/cold rolled strips. Galvanizing process is broadly divided into hot dipping and electro-galvanizing. The hot dip process is more suitable for heavy coating weights, and electro-galvanizing for lighter coatings. For reasons of efficiency, galvanizing of cold rolled strip is more common than galvanizing of cold rolled sheets. Hot dip galvanizing – The principle of the process consists of the immersion of steel strips in molten zinc. The zinc used for galvanizing is high grade with a zinc content of minimum of 99.95 %. After passing through the pretreatment tanks for degreasing, pickling, and cleansing, the strip passes through the annealing furnace and a pot containing molten zinc. The annealing furnace is used to apply the heat cycle needed to obtain the required mechanical properties and activate the surface with a reducing gas, which makes it easy to coat zinc on the strip surface. The coating weight is controlled by a purge gas jet blown on both surfaces of the strip from a nozzle above the pot, to remove excessive molten zinc. 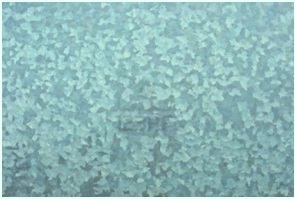 This process gives a relatively thick coating of zinc that freezes into a crystalline surface pattern known as spangles. During the process, a multiple layered structure of iron-zinc alloys is formed between the inner surface of the zinc coating and the steel strip. Electro-galvanizing – The principle of the process consists of immersion of steel sheet in an electrolyte, a solution of zinc sulfate or cyanide. Electrolytic action deposits a coating of pure zinc on the surface of the iron or steel. The advantages of this process is that the thickness of the coating can be accurately controlled while the limitation of this process is that the thick coatings provided by the hot dip galvanizing process are not usually possible with this method. A part of the GI steel production is corrugated to produce corrugated sheets (GC). Today the corrugation process is carried out using the process of roll forming. This modern process is highly automated to achieve high productivity and low labour costs. In the corrugation process sheets are pulled off huge rolls and through rolling dies that form the corrugation. After the sheets pass through the rollers it is automatically sheared off at a desired length. The standard shape of corrugated material is the round wavy style, but can be easily modified to a variety of shapes and sizes by simply changing the dies. The cross section of a galvanized strip is composed of the steel substrate, iron-zinc alloy layers, and a zinc layer. Because the paint adhesion and weldability of the surface of this zinc layer are not necessarily good, galvannealing has been developed to improve these properties. In the basic process for galvannealed strip, the zinc-coated strip emerges from the pot and is heated in a galvannealing furnace, forming an iron-zinc alloy layer by the inter-diffusion of iron and zinc coating layer, so that the surface of the zinc layer also contains some amount of iron. The galvannealing line is usually equipped with a skin pass mill, a tension leveler, and chemical treatment equipment for chromating, following the galvannealing furnace. GI sheets are produced both in annealed and full hard conditions. The galvanized iron (GI) sheets are produced as plain coils / sheets (GP) and corrugated sheets (GC). Corrugated sheets are also known as corrugated galvanized iron (CGI) sheets. These are value added steel products which are tough, sturdy, light weight, bright, corrosion resistant and easy to transport. These are usually produced in the thickness range of 0.15 mm to 2.0 mm and width range of 800 mm to 1560 mm. The weight of zinc coating varies from 100 grams square meter (gsm) to 750 grams square meter. The weight of zinc coating varies with the thickness of the steel sheet and the application of the GI sheet. Estimated life of galvanized iron sheets in different atmospheric conditions are given in Tab. 1. GP and GC sheets are classified as ordinary (GP), ordinary hard (GPH), lock forming (GPL), deep drawing (GPD), extra deep drawing (GPED), corrugated ordinary (GC) and corrugated ordinary hard (GCH). For producing these different qualities of these GI sheets the quality of raw material (cold rolled sheet) is chosen accordingly. GI sheets are subjected to bend test. These sheets are to withstand bending through 180 deg around a mandrel of specified diameter without peeling or flaking of zinc coating. GI sheets meant for corrugation are not required to undergo the bend test. GI sheets are also to undergo coating test as per the specified standard. Both GP and GC sheets and GI sheet coils are to be reasonably flat and free from bare spots, holes, tears and other harmful defects. In case of GC sheets the depth of corrugation is usually 12.5 mm and 17.5 mm and the pitch of corrugation is 75 mm. The number of corrugations varies with the width of the GC sheet and is usually 8, 10, 11 or 13. GI sheets are sheets are used extensively in various applications. Some of common uses are given below. Agriculture – Grain silos, sprayers, ghamellas, pans and feeding troughs etc. Automobile sector – Car, bus and truck bodies, undercarriage work, air and oil filters, fuel and oil tanks, exhaust pipes etc. Construction – Roofing, side walls, partitions, panels, valley gutters, louvers, false ceilings, partition walls and ducks, rolling shutters, highway bumpers, slotted angles and paint coated products etc. House hold things – Trunks, ice boxes, tubs, buckets, storage bins, water tanks, washing machines, house hold machines, pipes, pipe fittings and bath room doors etc. Electrical appliances – Air conditioners, refrigerators, freezers, electrical panels, decorative lamps etc. Furniture and fixtures – Desk, lockers, almirahs, racks, light weight chairs etc. Other general uses – Ducting, drums/barrels, containers, thermal cladding, railway coaches, sign boards, hoardings and road signs etc. The use of GI sheets gives the following advantages. Low cost – Galvanizing is lower in first cost than many other commonly specified protective coatings for steel. Less maintenance cost – GI sheets are virtually maintenance free and last longer. Long life -The life expectancy of GI sheets is quite high in rural, urban and coastal environments. Reliability. Galvanizing is usually carried out as per standards and minimum coating thicknesses are applied. Coating life and performance are reliable and predictable. Toughest coating – A galvanized coating has a unique metallurgical structure which gives outstanding resistance to mechanical damage in transport, erection and service. Automatic protection for damaged areas – Galvanized coatings corrode preferentially to steel, providing cathodic or sacrificial protection to small areas of steel exposed through damage. Unlike organic coatings, small damaged areas need no touch up. Complete protection – Every part of a galvanized iron sheet is protected. Ease of inspection – Galvanized coating is assessed readily by eye, and simple non-destructive thickness testing methods can be used. Galvanizing process is not dependent on weather conditions. The surface of GI sheet is aesthetically pleasing. Very good information on Galvanizing. How spangle is controlled in hot dip galvanizing? Why it is important? Thank you for the very use ful article.